The House of Comprehension is the best tool for English Language Arts teachers in grades 6-9 to help their students learn to understand structure in literature. The program in the book offers educators a complete solution that helps students learn how each element of literature adds depth to a story and further increases students’ enjoyment of reading. How does The House of Comprehension benefit teachers? What is the focus of The House of Comprehension program? • To teach through activities that are inspiring, interactive, and evocative. “The Ten-Sentence Format,” my Primary Free Product, forms the writing backbone of the ELA class. It works whenever a teacher wants students to write about literature for warm-ups, lesson closure, quick comprehension checks, or short answer essays on tests. Writing - "Just Say NO to Dull Writing,"
Writing - "Just Say, 'NO!' to Dull Writing", a list of words and phrases with reinforcing activities to make their pieces stronger and more effective. This teachers' resource has been received very favorably by teachers and administrators alike, with a Profile piece in "Northern Virginia Magazine" (November 2013) "Warding off the Wolves"
http://www.northernvirginiamag.com/entertainment/faces/2013/11/30/warding-off-the-wolves/, and on Amazon: https://www.amazon.com/House-Comprehension-Grades-6-9/dp/1938406176. 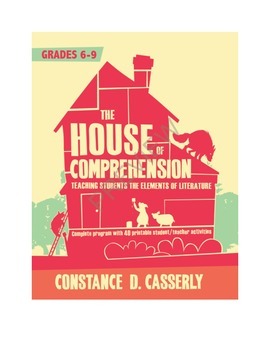 "Casserly does an excellent job of collecting and creating and organizing activities coherently, many of which will serve perfectly as scaffolding upon which student comprehension can be built…"
EBook - "The House of Comprehension"